Posted in: Charleston, Family Circle Cup, WTA. Tagged: charleston, Danka Kovinic, family circle cup, jessica pegula, Kateryna Bondarenko, Kristina Kucova, Laura Stiegemund, qualifying, Sara Sorribes Tormo, wta. It’s Easter Sunday at Family Circle Cup in Charleston and that means the annual Easter Egg Hunt. It also means lots of kids on the grounds. My favorite kid was the one who was apparently intrigued by a foot fault call, because he ran around the rest of the afternoon screaming “Foot Fault!” to various startled fans. A big psych to you, tennis fans. Way to go, kid! No Easter Eggs for 44-year-old Kimiko Date-Krumm but a bagel and a breadstick instead as German Laura Stiegemund breezed past Date-Krumm at 0&1. Sara Sorribes Tormo probably had the second easiest day. 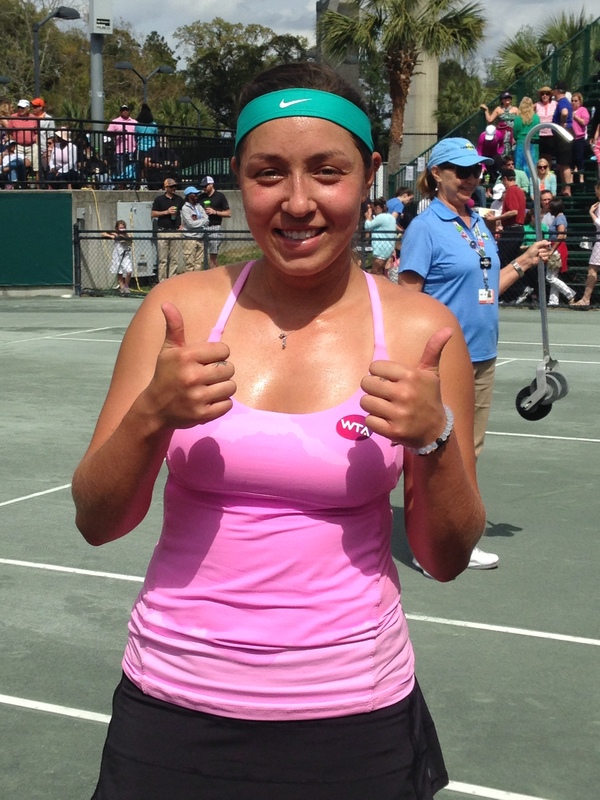 The Spaniard took out Jovana Jaksic 6-2, 6-2. Sorribes is one loud and animated customer and she got the job done this weekend. American Jessica Pegula, who trains at the Family Cup Tennis Center, used the home court advantage to pull away from Lesley Kerkhove in the second set, 7-6(5), 6-3. Thank you, Jessica. Kateryna Bondarenko, with husband Denis pacing the stands, were both relieved to escape a tough out in Beatriz Haddad Maia 6-4, 7-6(10). Match point was a bad call from my spot behind the baseline, but the call was upheld after a challenge, sending the 27 year old Ukrainian back into the main draw in Charleston. A nice effort and a decent weekend for Haddad nonetheless. Another great effort that fell short but was ultimately impressive on the weekend belonged to Maria Sanchez, who lost to Kristina Kucova on Althea Gibson Court 6-4, 1-6, 6-4. The match of the weekend for me was Danka Kovinic’s 3-set nail-biting win against Naomi Osaka. 4-6, 6-3, 7-6(8) was the final score. This match could have easily gone Osaka’s way several times. Credit to Kovinic for persevering. On the final match of the day on Court 3, top qualifying seed Lucie Hradecka survived a first tough set with Czech compatriot Barbora Krejcikova to advance to the main draw, 7-6(3), 6-4. And the final match of qualifying weekend 2015 found Louisa Chirico with a three set loss against Sesil Karatantcheva, 6-3, 1-6, 6-1. The 8 Americans went 1-7 in qualifying, with only Jesse Pegula advancing. She’ll play Sachia Vickery tomorrow.